This bed cover of fine linen has been embroidered with silks in satin, stem, long and short and fern stitches, with French knots, speckling, sheaf, lattice and other filling stitches. The ground is quilted in back stitch. It belonged to the Parminter family, who lived in Devon, and is said to have been made by three sisters as a wedding present for their brother. It is, in fact, unfinished, as the edges are raw, parts of the quilting are incomplete and it has never been backed. 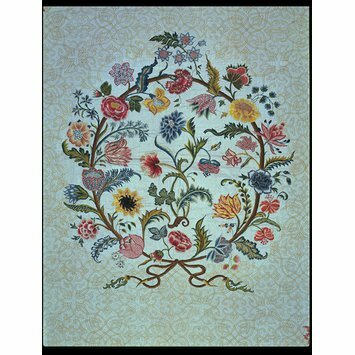 The cover is currently on loan to the National Trust and displayed at A La Ronde, the house built by Jane and Mary Parminter in the 18th century. The image attached is a details of the centre of the cover. Bed cover of fine linen, backed with pieces of coarser linen, and embroidered with polychrome silks in satin, stem, long and short and fern stitches with French knots, speckling, sheaf, lattice and other filling stitches. The ground is Italian, quilted in back stitch. The cover is divided into a centre panel and four valances by a decorative line embroidered with yellow silk approximately 15"-17" from the edge. 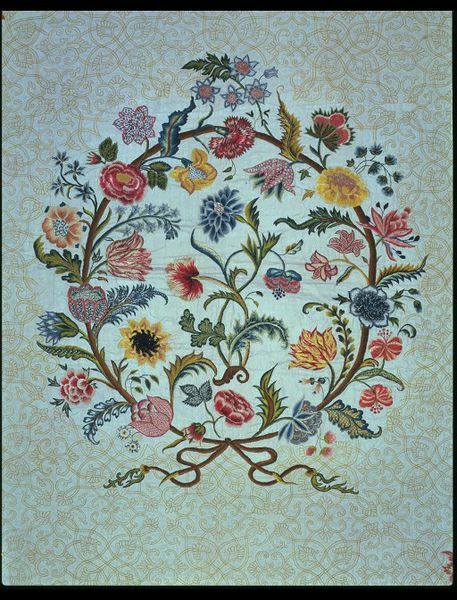 Within this line are four corner pieces and a central medallion of plain linen embroidered with well-shaded naturalistic floral motifs. The remainder of the ground, including the valances, is Italian quilted with a complicated repeating design of interlaces compartments with coiling stem finials and stylised leaf or shell technique. One corner of the linen backing is stamped with the name 'WILLIAM MENZIES'. On long-term loan to the National Trust at A La Ronde, Exmouth, Devon, since 1995 (RF 1994/37). 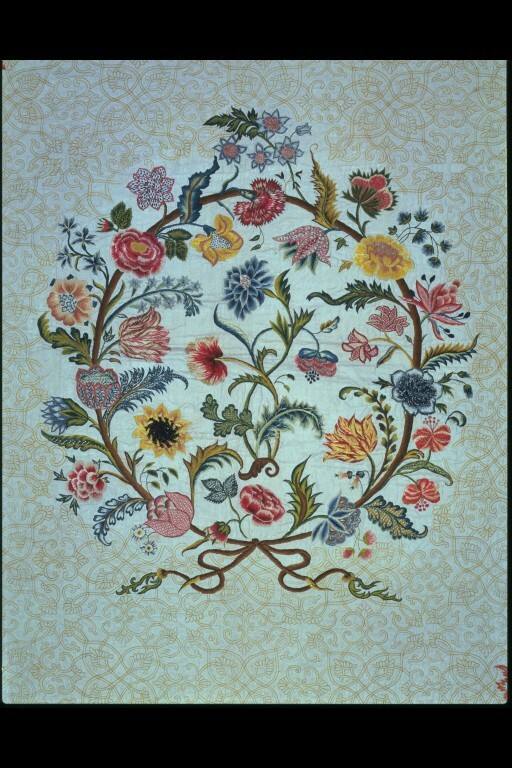 Embroidered bed cover, England, 1725-1750.